Army Sgts. 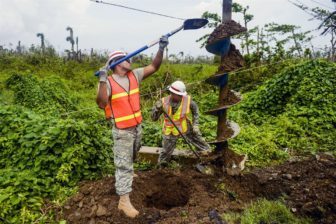 Luis Ruiz, left, and Jonathan Quinonez clean the dirt off an auger as they dig a hole to place a concrete power pole in Rio Grande, Puerto Rico last October as part of Hurricane Maria relief efforts. Washington – Congress is about to resume a bitter dispute about how much more federal help to provide Puerto Rico, where many residents are still without electricity or functioning schools or hospitals more than a hundred days after Hurricane Maria devastated the island. To Democrats like Sens. Richard Blumenthal and Chris Murphy, who returned to Washington after a two-day trip to the island, and to many Puerto Ricans and their advocates, the response has been pathetic. 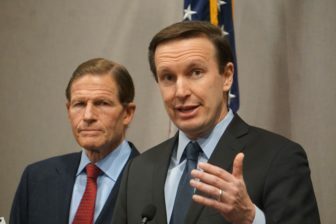 “If this were happening in Connecticut, there would be riots in the streets,” Murphy said. In October, Congress approved a $36.5 billion disaster relief package that included aid for Puerto Rico along with help for Texas, Florida and other states battered by last summer’s hurricanes, as well as funding for California’s wildfire recovery efforts. But Blumenthal and Murphy are critical that much of that money, including funding for Community Development Block Grants that could be used in many ways for reconstruction, have yet to reach Puerto Rico. “I put the blame on Donald Trump and the Republicans in Congress,” Blumenthal said of what he called “abjectly inadequate” recovery efforts. Before breaking for the holidays last month, the U.S. House approved an $81 billion emergency aid bill to help communities in Texas, Florida, Puerto Rico and California rebuild. The disaster package nearly doubled what President Donald Trump wanted to spend, but it stalled in the Senate after Democrats objected that it did not include enough money for Puerto Rico and the Virgin Islands, which also was a victim of last year’s hurricanes. The bill is expected to come before the Senate again soon. But Connecticut’s senators say much more money is needed for Puerto Rico’s reconstruction, and they will seek additional money in a massive spending bill being negotiated now that is needed to keep the federal government operating past Jan. 19. Murphy said he would seek “vastly expanded funding” that is “specifically targeted” to help Puerto Rico. Puerto Rico disaster aid is just one of several Democratic priorities in discussions over the federal spending bill that would avert a federal government shutdown. Other issues include protections for young immigrants known as “Dreamers,” long-term funding for the Children’s Health Insurance Program and community health centers and increased money for the National Institutes of Health and to combat opioid addiction. Puerto Ricans are U.S. citizens but they have no representation in Congress, nor can they vote for president. The island became a U.S. territory in 1898 during the Spanish-American War. The senators visited hospitals and relief organizations during their brief visit, and toured Caño Martín Peña, a neighborhood in San Juan. They are frustrated that the pace of power restoration is slow – nearly half the population is still without electricity – and promises that power would be fully restored in December have slipped to March. “We have no faith that March will come and electricity will be there,” Blumenthal said. Another looming crisis for Puerto Rico is that the island is expected to soon run out of money to continue its Medicaid program. About 40 percent of the island’s residents receive Medicaid, the joint state-federal medical program for the poor. Puerto Rico receives less in matching funds than mainland states to help cover Medicaid costs. The $81 billion aid package that stalled in the Senate would provide $27.6 billion for the Federal Emergency Management Agency (FEMA), $26.1 billion in additional Community Development Block Grants, and $12.11 billion for the Army Corps of Engineers. While Hurricane Maria caused serious damage to Puerto Rico’s health-care system, none of the federal relief money to date has been earmarked for Medicaid. When Hurricane Katrina slammed into Louisiana and Mississippi in 2005, the federal government increased its share of Medicaid funding to those states. “We need to get our priorities straight,” said Yanil Terón, executive director of the Center For Latino Progress and a native of Puerto Rico, who has lived for 30 years in South Windsor. To Terón, Puerto Rico has been treated with discrimination as the federal government has responded to the slew of natural disasters that hit the nation in 2017. Terón’s sister and brother-in-law live in Caguas, one of the many Puerto Rican towns that still lack power. To “take a break from living under those conditions,” Terón said the couple took a leave of absence from their jobs and came to visit her for several months in South Windsor. They plan to return to Puerto Rico at the end of the month. But many others who have fled to Connecticut may stay a lot longer, and some may never return. In 2014, Connecticut had the highest per-capita percentage of Puerto Rican residents, more than 300,000, or about 8.4 percent. Those numbers are believed to have increased as Puerto Rico’s economic turmoil increased and were boosted again after Maria. “We’re glad to provide shelter for the thousands of Puerto Ricans who are coming, but it’s a burdern to the schools,” Murphy said. So he and Blumenthal say they are committed to speeding Puerto Rico’s reconstruction and will use their leverage – as members of the minority they can still block legislation through filibusters if Senate Democrats unite. “The bottom line is that we can’t trust the government to give Puerto Rico what it needs,” Murphy said.